9 October: The Upper Midwestern States of the USA officially commemorate Leif Erikson Day, actually the day when the immigrant sloop “Restauration” out of Stavanger, Norway, arrived in New York harbour in 1825. Rasmus B. Anderson’s parents were Quakers who organised the first Norwegian immigration of 52 brothers and sisters of their faith, the sloopers, from the Vestlandet region to the Wisconsin territory during the late 1820s. A generation later, Anderson graduated from the University of Wisconsin-Madison, became a professor there, founded the Department of Scandinavian Studies, as well as the the Norrœna Society, dedicated to the “History and Romance of Northern Europe”, published a couple of books and his “America Not Discovered by Columbus” from 1874 that set off an avalanche of Viking-enthusiasm in the United States and elsewhere in the world, popularising the idea that the Norse were the first Europeans in the New World. Now everywhere, from the eastern seaboard to areas as far west as Minnesota where enthusiasts believed they had discovered a rune stone, artefacts and architectural relics of an alleged Norse origin popped up. Bjarni Herjúlfsson was a decent sort, obviously. Mater and pater, Herjólfr and Thorgerdr, had settled down in Iceland, while young Bjarni began a career as a merchant captain back home in the old country, in Norway, but the young travelling salesman took the time to visit his folks every winter in their new home. Then, one December in the 980s, Bjarni learned that his old man had caught the travelling bug and sailed with Eiríkr the Red to Greenland. His son decided to follow suit, took his crew and shipped for the new Norse colony as well. North Atlantic waters, being what they are, had something different in store for the young skipper, though. 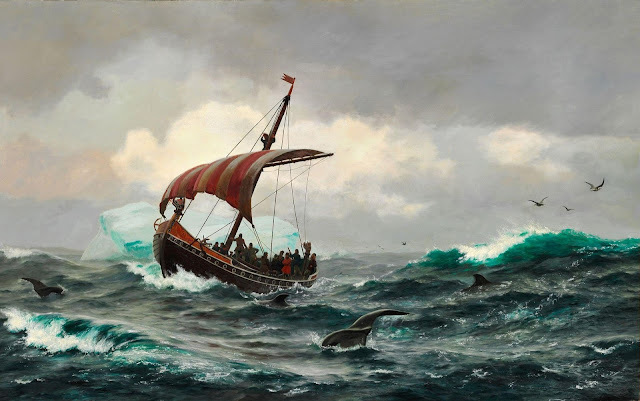 Blown off course, his sturdy knarr, the archetypical Norse merchantman, clinker-built, but with a wider, deeper and shorter hull than a longship, and sans prow beast, naturally, ended up far to the West of Greenland. 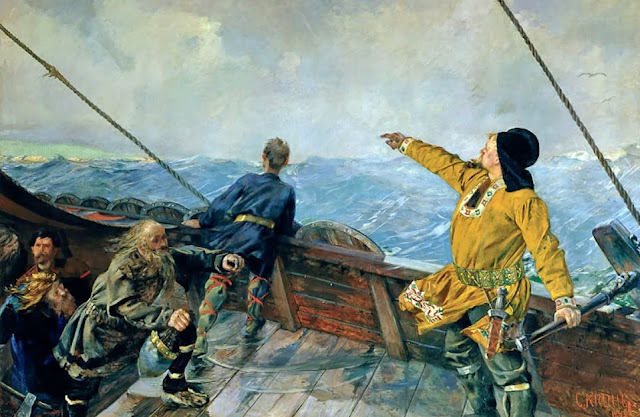 Bjarni and the boys sighted land, green, like the place they were headed for, but with tall trees and mountains and while his crew begged him to go on shore and explore, their skipper decided to turn his prow around and sail east, away from undiscovered countries from whose bourns travellers might not return, even if he was Norwegian and not Danish. Coming from the land of ice and snow, from the midnight sun where the hot springs blow, Leifr Eiríksson meanwhile had founded the first permanent Norse colony of Greenland in 986 with his father, said Eiríkr the Red. Young Leifr left the place around the year 1000, sailing to the West with two knarrs, to follow up from the lead Bjarni Herjúlfsson had provided. And it was Leifr who finally landed in a place probably in Newfoundland he called Vinland, the Meadow Land, founded a settlement and spent the winter there, making him and his crew the first Medieval Europeans on North American soil. During the 1960s, the Norwegians Helge and Anne Ingstad discovered the remnants of a Norse settlement on the northern tip of Newfoundland near L’Anse aux Meadows, but not necessarily Leif’s winter quarters of Leifsbúðir. However, besides the mentions in the Icelandic sagas, there is scarce evidence that the Norse settled in America, even if it was for a period of a couple of years only. The knowledge of land beyond Greenland whose Viking settlements vanished during the 15th century might have survived in European ports though, and Columbus could have heard about it when planning his voyage to India. Or not. Anderson had initiated the idea of honouring Leif Ericson as the discoverer of America as well as his slooper parents with a public holiday and during a celebration of the centennial of their arrival in 1925, President Coolidge publicly acknowledged Leif Ericson as the first European in America and by 1930, “Leif Ericson Day” became a state holiday in Wisconsin, followed by Minnesota, South Dakota, Illinois, Washington and finally California and Nevada. And a presidential proclamation is issued every year on honouring the contribution of Scandinavian immigrants to the US, the heritage and the spirit of exploration in general.